The Fast & Furious series has had quite the evolution over its 14-year existence. What began as a look at the lives of Los Angeles street race culture moved on to action/heist in the middle installments and, now, a full-fledged men (and women) on a mission movie. Perhaps the title, in a series that plays fast and loose with titling, of Furious 7 – spelled out as Furious Seven in the opening credits – is a nod to Seven Samurai and The Magnificent Seven. Perhaps not, but without question the characters have taken on mythical traits when it comes to vehicular-based exploits and espionage. And, despite the impossible stunts and ridiculous plot developments, the film delivers with most of its self-aware lunacy. Dominic Toretto (Vin Diesel) is back in LA after taking down Fast & Furious 6 baddie Owen Shaw in London. So are his riding buddy Brian O’Conner (Paul Walker) and sister/Brian’s squeeze Mia (Jordana Brewster), settling down with their young son. Brian even has a minivan. Owen’s brother Deckard (Jason Statham) – an even more menacing antagonist – is out for revenge, targeting Dom, Brian, and their entire crew. After Han (Sung Kang) is taken out and occasional collaborator Agent Hobbs (Dwayne Johnson) is incapacitated, the team reassembles to face the new threat. Along for about the fifth, and certainly not the last, “one last ride” are Letty (Michelle Rodriguez), Roman (Tyrese Gibson), and Tej (Ludacris). Stakes are raised by adding shadowy government operative Mr. Nobody (Kurt Russell), who promises Dom a crack at Shaw if his crew can rescue computer hacker Ramsey (Nathalie Emmanuel) from the clutches of terrorist Jakande (Djimon Hounsou). She’s developed a revolutionary surveillance device called “God’s Eye” and if Dom retrieves it, Mr. Nobody will allow him to use it to track down Deckard. Convoluted sure, but it makes enough sense in the moment, even though God’s Eye is wholly unnecessary to find Deckard. He pops up everywhere Dom goes, looking to wage hand-to-hand and automotive combat. The battles and stunts are what matters here, and director James Wan, taking over from Justin Lin who helmed the previous four films, manages the carnage admirably. 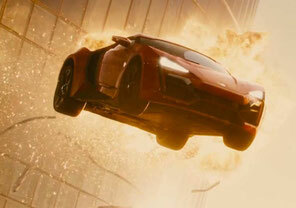 These street racers are now superheroes who drive cars out of planes, down mountains, and jump them between Dubai skyscrapers with little consequence, and while this isn’t necessarily believable, it sure is exciting and is rendered well on-screen. There’s also a bigger focus on fisticuffs, with many of the heroes given a nemesis to punch and kick. Dom has Deckard, Brian has a martial arts expert played by Tony Jaa, and Letty gets to brawl with MMA champ Ronda Rousey. The tangles up the urgency and bolster the action/adventure progression of the series. Russell’s Mr. Nobody also signals a foray into the superspy genre, giving Dom an M to his Bond. He not only serves up this gibberish plot, but opens up a whole new world for future missions. Attempts at grounding come in typical Fast & Furious fashion, by referring to the crew as a family that always has each other’s back. Even though the family angle is quite literal in the case of Brian, Mia, and Dom, it’s mostly lip service and the character bonds wouldn’t mean much if all the crazy car stunts were stripped away. In a way, though, it’s hard not have an affinity for these ciphers as they’ve morphed into an amalgam of different archetypes. All of the main protagonists are likeable and serve their purpose well, the connections deepening as the mythology of the series grows. Finally linking the continuity to the third installment (which actually sits 6th in the current timeline), The Fast and the Furious: Tokyo Drift, is a neat thing for fans, even if the stock footage and stock shots of Tokyo briefly take you out of the moment. Lucas Black ages 8 years in about 30 seconds. Of course the biggest challenge of the production was the very real tragedy of Paul Walker’s untimely death. Much of Furious 7 was rewritten and digital manipulation using stand-ins, including Walker’s brothers, was used to complete the film. Though there are some issues with editing around Walker’s character, especially in the LA-based finale, Wan commendably put together a coherent, free-flowing action opus that also has a heart. The director, Diesel, and crew give Walker a wonderful cinematic sendoff that is appropriate and heartfelt without being overly sentimental. The emotions are real here, and when mixed with the rousing thrills provide insight into what’s made this series so sustainable.